Doggo's halti snaps and he doesn’t seem to notice. Either that or after thirteen years he’s finally learnt to walk on the lead without pulling. All the same I think I’ll get him a new one, just in case he’s not the reformed character he currently appears to be. I go for a swim instead. The last time a motor racing Grand Prix was held in Russia was 1914. Now racing has returned there exactly 100 years on. 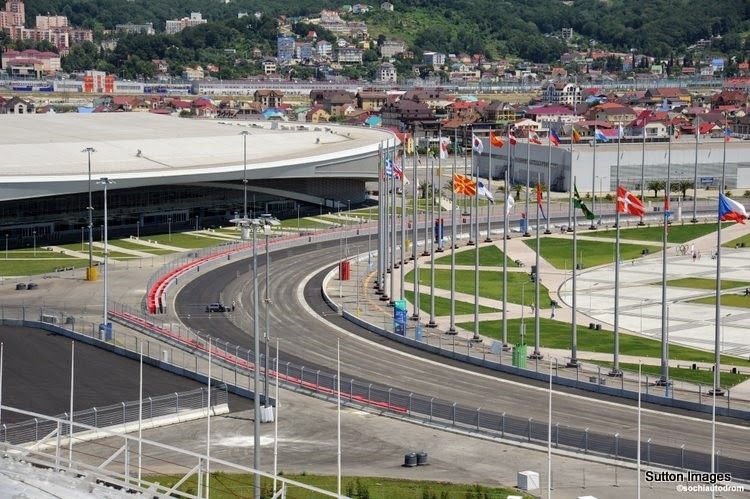 It was held yesterday in Sochi where we were for the Winter Olympics and they’ve actually built the track in between the stadiums. It’s still raining later when I pick L up from her book club’s Booker Prize evening, although she does keep me waiting for half an hour. Doggo and I amuse ourselves watching a constant stream of folk attempting to park their oversized people carriers outside the community hall across the road and mostly failing. Usually they then resorted to abandoning said vehicle in the middle of the road and tottering in to the hall on their equally oversized high heels (applies generally only to the women) before emerging later dragging their offspring out from whatever event is on there. MD sleeps through everything.